For such a short story it carries a large impact. There are actually two stories in one with the two main characters in both. 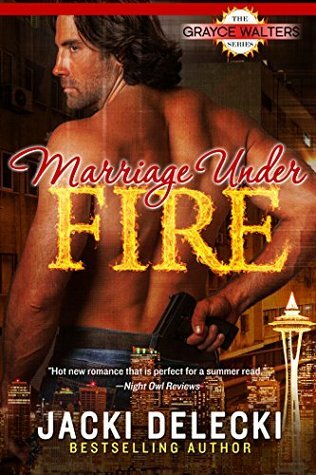 The first part “Marriage Under Fire” is with undercover agents from the USMC Maddy Jeffers and Hunter Hines going under as husband and wife. This makes them both a bit uncomfortable since they know each other through Hunter’s sister Angie who is Maddy’s best friend. Not to mention Hunter outranks her so she has to act a certain way. It’s more like a sexual tension not to mention Angie and she like to tease him. He is a man with mommy issues so it makes it easier. You see his mom took off on him and his Marine dad when he was ten years old for another Marine. So he had major trust, loyalty, and faith issues. So, when his dad married Angie’s mom and had her there was confusion for sure. For his dad had always bashed his mom and all women. Angie’s mom was older and settled in her was so it could have been a factor that he felt that she wouldn’t be out looking for men. Maddy had her own trust issues she was a foster child raised in the system. She lost her parents at a young age and bounced around a lot. She joined the Marines to have a sense of belonging, family, and she knew she would never be left behind. Once she met Angie she was the sister she never had a real connection. Then when Angie, after a long separation, and Hunter came looking for her and found her along with Maddy, a twofer. He read up on Maddy and was totally impressed at her character. Especially, from the background she came from. She is tiny but mighty in dedication to be a good Marine like he and his sister.